Thanks, Bern (and Laura)! 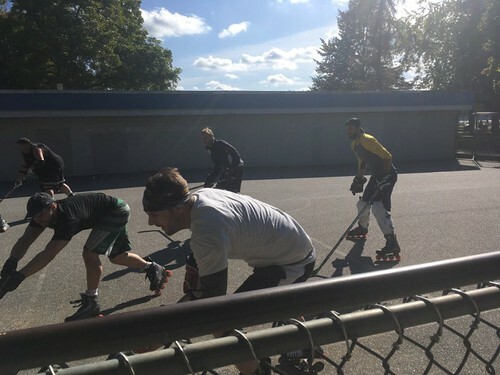 The star of the second session of this mini-season would appear to be Dom, with a stellar .857 on 72 saves and five straight wins versus Sam, who finished at .648. Scoring-wise, Ryan was rocking the goal with 10G. Coupled with 5A, he tied Andrew (6G-9A) for first star. Despite missing the final game, Pat still finished third at 5G-7A and may have been in on first star had he stayed in his impressive rookie session. Ollie missed third star by just a point with 7G-4A. 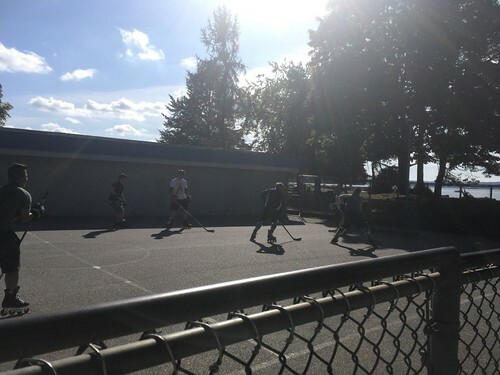 If that's all for Burton Hockey for a while, it was a fun way to come together for another hockey reunion at Ambleside Park. Season Stats: Ryan owns the 2017 scoring lead, 26-22 over Oliver, backed by his 17 goals... Oliver leads Andrew and Ryan in assists, 11-9-9... Ryan, Stefan, Sam, Dom, and the Koth-Kappi have played in every game this season... Ryan leads in three-star points and in total star points with 25 of each; Dom is second in total star points with 20... Pat and Andy are tied for the lead in PPG at 3.00...All of the season session scoring and goaltending highs were set today. SDF/GDF: The SDF is designed based upon having a full complement of sessions on board to work with. When you only have two in two years, that means anything can happen since one good performance can shoot you directly to the top. In this case, the debuting Pat Latham rockets right to the top of the SDF rankings after just four-fifths of a session! Andrew also reappears on the rankings in second, with incumbent #1 Rob Hajdu falling all the way down to seventh... Little change on the GDF other than the increase in Dom's lead over Sam; it's Dom's 29th career ranking led. On the All-Time Front: Oliver is just 11 points away from the magical 3,000 point mark... Bernie becomes the fourth player with 1,800 points... Rob needs 15 points for 1,300... Ryan is five points behind Graeme Orr for 12th in points... Oliver needs 12 goals for 1,200... Bernie still needs one goal for 750... Rob is nine goals from 600... Ryan is seven goals behind Justin Gordon for 10th... Andrew is three goals behind Pat Elischer for 12th and 15 goals behind Ryan... Oliver becomes the first player to reach 1,800 assists... Andrew becomes the sixth player with 700 assists; Rob is six away from that mark... Oliver needs ten shots on goal for 6,000... Andrew needs 11 shots on goal for 3,000... Dom needs seven more games played for 800; Rob needs six for 600... Andrew becomes the 20th player to play 400 games... Dom needs three more games goaltended for 700... Dom needs ten more total star points to become the third player with 1,000... Andrew leads his 39th session in scoring, one behind Kyle Grenier for second... Andrew becomes the fourth player to score 1,200 points in VRH... Bernie's 31 consecutive sessions ties him for the seventh longest streak of all time.